Good listening, good feeling, good news- "Gospel R & B merging a urban sounds of rhythm and blues in soul and trials with the good news of Christ's mercies and triumph; also includes worship and praise." 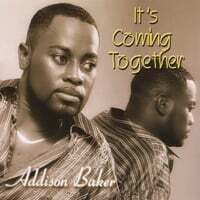 Addison Baker –CEO, Executive Director, Pastor and Minister with diploma in Computer Programming and Cosmetology. He is a former youth minister of 6 years of the St. Luke Missionary Baptist Church; until he was later called as associate pastor for 7 years to The Church of the Holy Spirit at Little Rock, AR, which served as Spiritual Advisors to the local governor and later former President Bill Clinton. Addison later established his own ministries of 4 years, spanning a total of 18 years in the ministry. He is a prolific speaker and is passionate about the well-being of humanity, especially today’s youth. He is a tailor by trade and talented in the field of music as a worship leader and gospel artist in which he has won several awards. He has worked in various conventions such as the Gospel Music Workshop of America, The Baptist Training Convention, and MegaFest held in Atlanta. He serves as minister, spiritual counselor, and worship leader. He serves at 12Stone Community Church under the dynamic leadership of Pastor Kevin Myers. Displaying a gamete of local, national and international ministry, Addison also serves on the National Worship Team for The Gospel Music Workshop of America. Although he has a pastoral ministry, his passion is in serving the urban community. He works with transitional centers and shelters for men and women. He also has founded a pre-professional skills/mentoring program for youth. He is a full-time servant and student currently pursuing his BA in The Institute for Urban & Global Economic Development at the Beulah Heights University, Atlanta, GA.
A discography of 3 CD projects: “On 1 A-chord”, “I Will Praise”, and his latest “It’s Coming Together”. He is a writer and designer/artist of 2 books, “Simple Things In Life” (an inspiring book based on going through life) and “The Animals Next Door, a children’s story book and various animated characters.